Good day, my Friends! I hope you are doing well. I thought I would share with you my “Not Too Square” quilt that is featured in The Quilter‘s December 2012/January 2013 issue. 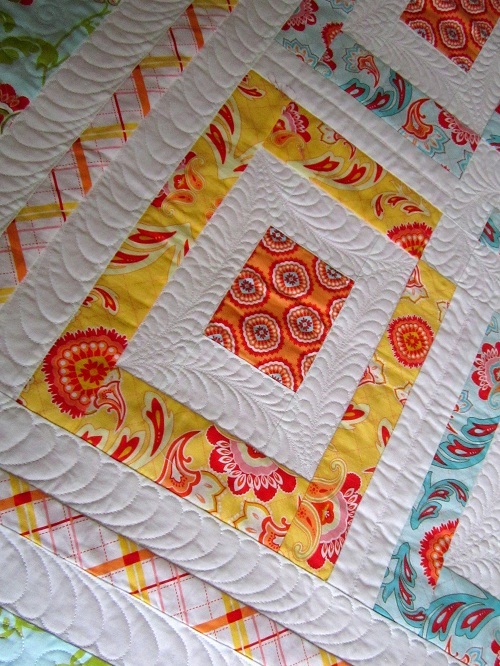 Quilt blocks are oftentimes thought of being square when considered. I decided to put a bit of a spin to that conventional thought and made my blocks rectangular. Thus the name “Not Too Square”. What a fun name for the quilt, eh? I had the grandest time making this quilt, and felt a little sad when the project was completed. I am really pleased by how good the blue, green, yellow, and, ORANGE fabrics from Riley Blake’s Avignon collection look together in the quilt! Since the principles pertaining to the color wheel are all greek to me, my approach to pulling colors together in a quilt is more “potluck-ish” in nature. :) So you can imagine my delight when I saw how the slightly strange color scheme unfolded before me in a very pleasing manner. Here you see “Not Too Square” in different poses. 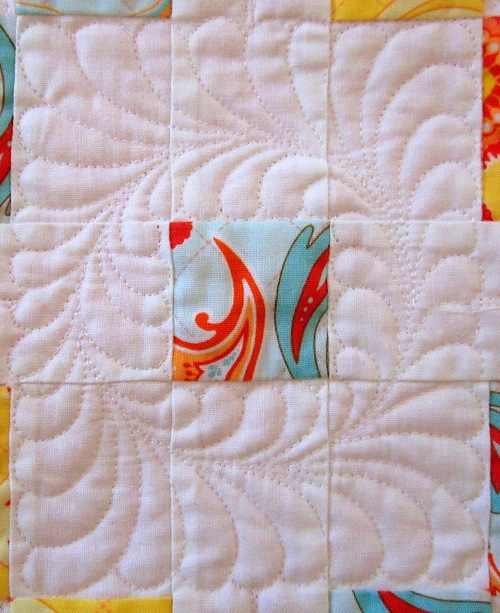 Quilting was done with Aurifil Mako 50 cotton threads over Hobbs Tuscany Silk Batt. Here are a few technical tidbits for the quilting junkies… :) I had a few thoughts prior to quilting, but the frames presented by the white fabric just screamed FEATHER WREATH to me! So that’s what I quilted. The quilted down white frames highlighted the print patches very well. The un-quilted print patches look raised nestled amongst the quilted down white areas. Click here for my Thread Talk post on feather wreath. 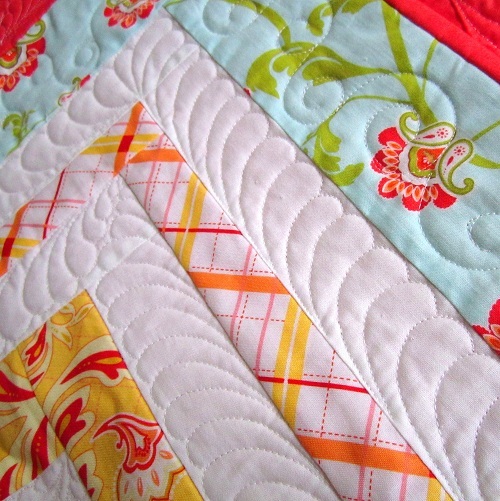 Click here for my Thread Talk post on the options I considered when quilting this quilt. Are you kind of liking “Not Too Square” yet? Well, the pattern instructions are offered free on The Quilter’s website. Isn’t that great? Click here to download the pdf file. “Lo, how a Rose e’er blooming from tender stem hath sprung! This entry was posted in Quilt kit, Quilt Pattern, Quilting, Quilts & Projects: Published, Quilts: Pieced and tagged Feather quilting, Riley Blake Avignon, The Quilter December 2012/January 2013 issue, Wendy Sheppard Designs. Bookmark the permalink. ← Exciting: Upcoming appearance at Rogers Sewing Center! As usual your feathers are wonderful! Enjoyed looking back on your thread talk about this quilt. The more I looked at the quilt, the more I grow to love it. The colors though bright and cheerful, they are also restful and almost peaceful. You usually think of those descriptive words as being opposite but I think this proves it can be all of them. Good job! I love this! 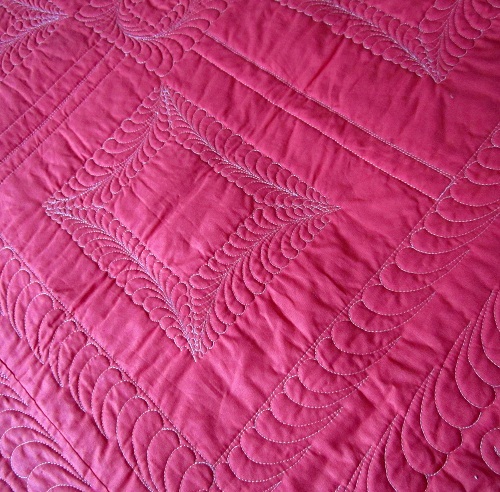 I like how the quilting is all on the white, and the white thread shows up so beautifully on the pink backing. Nice clear cheerful colors, too. Perfect for how gloomy gray the skies have been in Maryland for quite awhile! absolutely love the continuous feather around the small square! Neat application of the color wheel. As usual, you have done a fantastic job on the pattern, piecing and quilting. 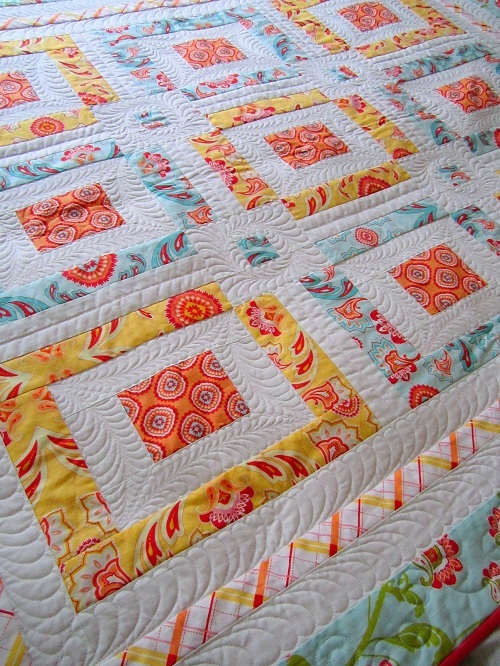 Actually, an amazing job on the quilting!!!! Thanks so much for sharing with us. It is such a modern looking quilt. 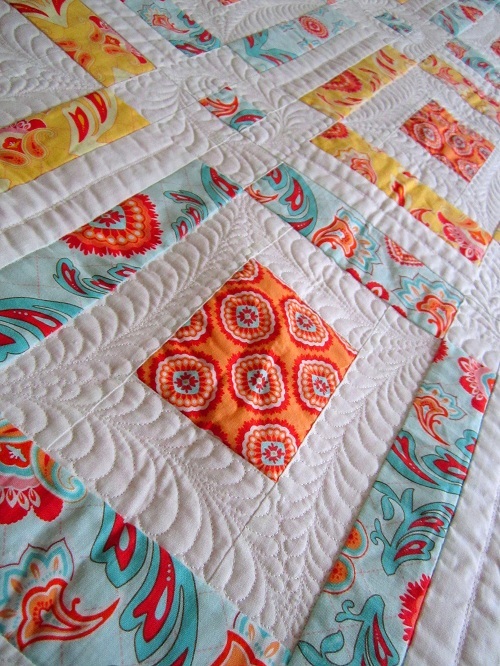 That is just darling, Wendy, I love it – and the quilting is awesome! Another great design Wendy! I love the use of the bias plaid in the border. This would work so well with any large print where you wanted to see big chunks of the fabric :*) Headed off now to get the pattern – thanks for sharing! you made a simple pattern into a work of art! Love the colors together. you may think you can’t do a color wheel, but you are doing so. Really lovely feathers. 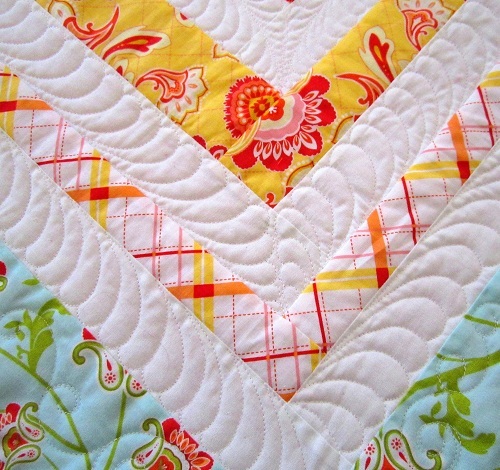 Like how you left the colored sections plain to stand out from the heavy quilting on the white. And yes, it is Lo how a Rose e’er blooming. arm? If so, I hope my feathers can look as good as yours someday! 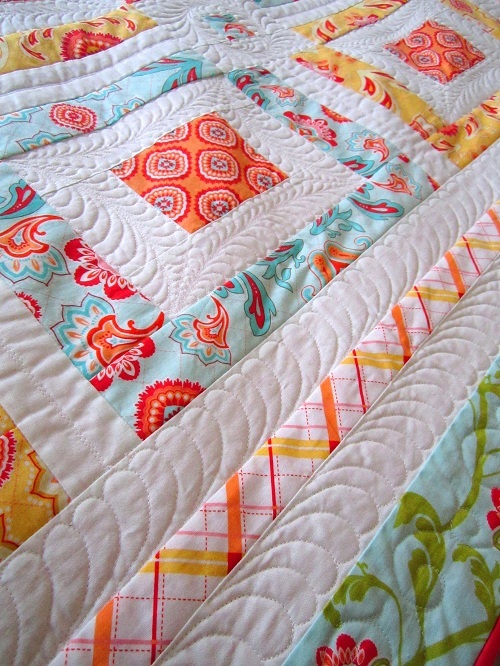 I really like the bright colors of the quilt and the idea of leaving the colored frames unquilted is very appealing. Your feathers are just wonderful. 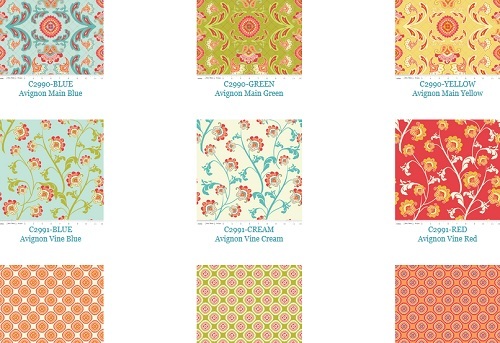 It would also make a terrific scrap quilt. I like having a bit if a different take from the traditional. That’s one of my favorite Christmas hymns. That is really cute with the rectangles.. I would like to show some of my toppers off but I don’t know how to add photos.. I think you might want to check the measurements in the magazine. I don’t think they are correct. This project can be a little confusing because it’s a rectangular block. Some of the strips in the block (the side strips) are 2″ wide and some of the strips (the top and bottom strips) are 2-1/2″ wide. However, they do add up correctly. The blocks are 9-1/2″ wide raw edge to raw edge and 12-1/2″ high raw edge to raw edge. 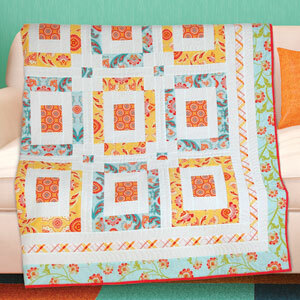 The quilt center is 30-1/2″ x 39-1/2″. Hope this helps? Thank you soo much for your info….It’s a beautiful quilt. I have a new machine and I will need to check the gauge for the 1/4″ foot. 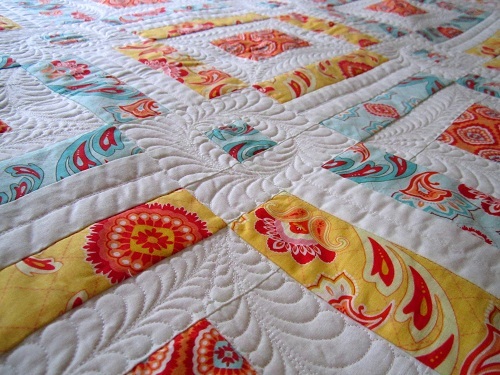 love this quilt , it is just stunning ! I saw on the side where you have free patterns and this one is there, how do you get it , I can’t seem to find it. Lovely quilt! I’m inspired. Perhaps i can make other square blocks into rectangles with eq 6. Thanks for sharing your idea! 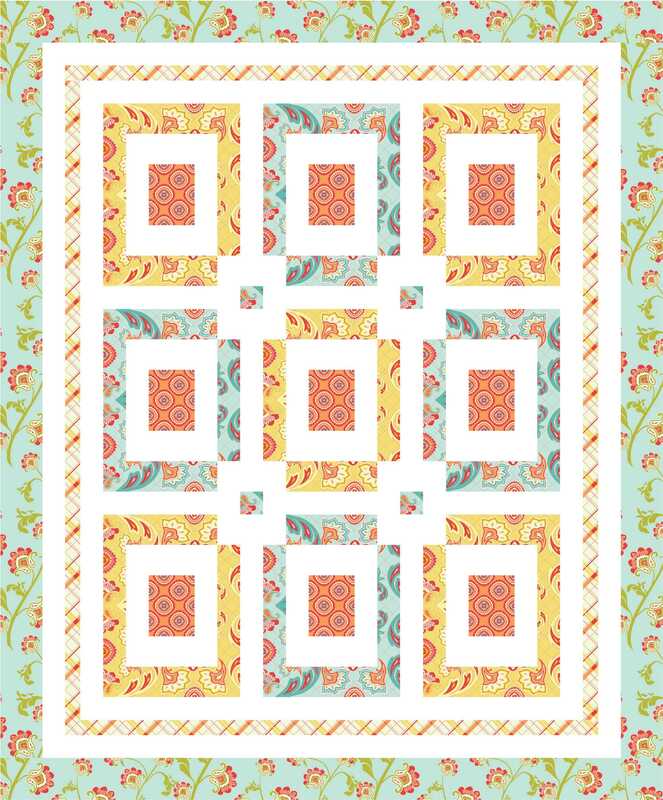 I realize it’s 2015 and you posted this in 2012, but I just love this pattern and the quilting. I say it is never to late to say thank you. So here’s a great big thank you! 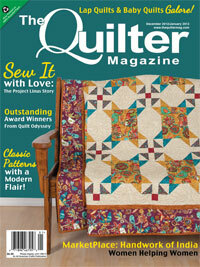 I tried clicking on the PDF pattern link, but it appears that The Quilters Magazine doesn’t have a website any more. Do you happen to have the file? It is such a lovely quilt. I found it on Pinterest a while back, but recently decided I wanted to make it. I would appreciate any help you can provide. powersjlc at gmail dot com. Thanks so much!